This Labor Day I find myself relaxing after a hectic but wonderful weekend and reliving all the memories created during this year's Festival. Discounting attendance at the Late Nite Catechism play last week my festivities started on Wednesday with attendance at the Festival's annual Elimination Dinner. We had a party of about 15 and one of our guests was lucky enough to be the next to the last number out. She was à sorority sister of my daughter Lisa's while both attended Marshall University. Deanna Bossellman and her daughter visited the Festival from Nebraska just to share the weekend with our family. Deanna donated her winnings back to the Festival. Thanks Deanna! Thursday gave us time to rest and get our nail, toes and hair done. 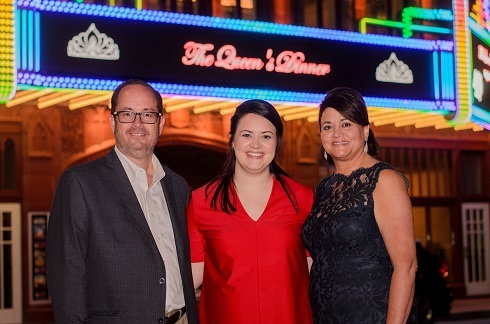 The traditional Queen's dinner was hosted by Lisa and Andy Lang and held at the Robinson Grand Ballroom with Julio's catering the meal. 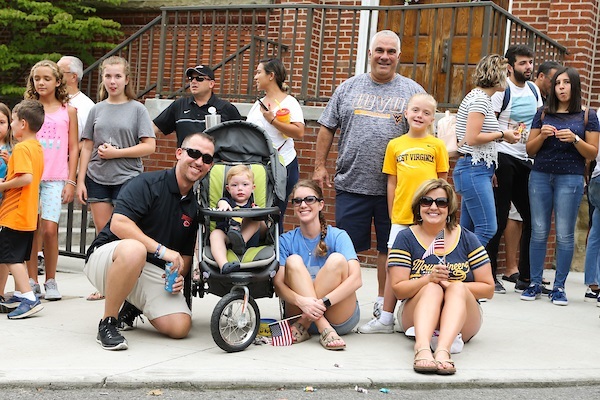 All of our family was present as was members of the Festival Court. One of the most beautiful things I saw this weekend was the marquee of the Robinson Grand Theatre with my granddaughter Miranda Lang's picture on it. It really is a beautiful marquee when lit up. Friday was the big day when my beautiful granddaughter appeared in her formal coronation gown to receive her crown. Her gown was designed and made by the designer from Elkins who handles the Forest Festival gowns. I sat on the stage with my daughter and son in law and there are no words that can describe the emotions I felt as Miranda was escorted to the stage. Although her Aunt Leslie once went through the same thing, it was very different this time. As the family of Regina Maria, we attended receptions and visited the former queen's gowns display that was organized by Rose Mazza and set up by Elyse Gemondo (herself a former Regina Maria). It was a very beautiful display. Saturday we were up early and attended a breakfast prior to the parade at the Robinson Grand. I was asked to participate as the grandmother of the Queen and although I could have as the former director or a former honoree, I found much pride in being the grandmother of this year's Queen. The crowd seemed larger than ever and the weather was great. I made my way on Saturday afternoon to Jackson's Square to watch the WVU game. While there I got to visit with Mary and John Shields, Boo Bellotte and Becky and Dave Danunzio. What wonderful memories we reminisced about from the Festivals of the past. We were all in agreement that all the hard work we did was worth it. If I close my eyes I can see Boo going up and down the street making sure the electric was working andJohn and Dave Seamon walked the streets overseeing the beverages, cups and bank deposits. Tom Basile could always be found behind the stage checking on the entertainment. And how about John Peters always manning the microphone as the mc. Now should be the time when I mention John Manchin, Jim Larosa, Sam Chico, Lou Spatafore and Sam D'Annunzio. These gentlemen were rarely seen on the streets as all their work was done prior to the start of the Festival. I could write a complete article about each of them but I will save that for another time. Sunday I was up bright and early as I prepared for the traditional Catholic mass on the main stage. This would have been the 38th time I served as an Eucharistic Minister for the mass. The mass and the music was beautiful. I hung around a little while after the mass but decided that I had just about reached my physical limits so I headed home to rest. My emotions were at their highest. I fully understand now why every minute I spent with this Festival was worth it. There are many of you who I am sure feel the same way. How did the Seamon's feel when that young lady sang following in the steps of her dad and mom. What must Annie and Louie Pishner think about Diana, Steve or Annie and who can feel Mike and Julie Oliverio's pride. I know they would never take back their efforts in making this Festival such a success and they would be so proud that the tradition continues. This Festival has touched the lives of so many families. 2018 is now in the books. I'm looking forward to next year but I first want to give a heartfelt and sincere "thank you" to the board and all the volunteers. The Festival would not take place without their dedication and support. Take care and until next week "Now You Have Heard It Through The Grapevine."